For smoother skin, which appears replumped and firmer. Certain areas of your face may need special treatments for a targeted result. Because you have specific requirements. Because each woman is unique and deserves tailor-made care, Simone MAHLER has developed specialised treatments for the face and body, using exclusive methods. All of our treatments are tested in Pilot beauty salons. 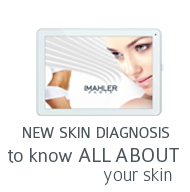 We have developed a personalised approach to beauty in the MAHLER beauty salons: a comprehensive programme involving treatments and products, based on a professional diagnosis, which guarantees effective, long-lasting results. An essential stage for you skin's beauty. Sometimes your skin needs targeted treatment, particularly on certain areas of the face. For a toned body and smooth curves. Pampering for your whole body! For a superb, radiant, long-lasting tan. The other essential gesture for soft, fresh skin. Exclusive products developed in our Research and Development Laboratory; Developing products from the most advanced scientific studies, subject to rigorous tests for the comfort of your skin and optimal results. We select active ingredients which are proven to work (either on tissue culture or in vivo) and use them at their optimal concentration. Découvrez dès maintenant dans vos instituts la véritable innovation beauté : Hydr'Activ Nuit.